Safety always comes first when dealing with molten metal. There are many precautions that must be taken to avoid any potential mishaps. One of these precautions is to make sure that all metals being melted are moisture free. In order to prevent moisture on the furnace charge, all metals should be preheated before being melted to evaporate any moisture that could be present. The same goes for any tools or other materials that come in contact with the molten metal. There are other safety precautions to keep in mind, like wearing the proper clothing and protective gear, making sure furnace cleaning tools are coated with a non wetting coating to prevent the aluminum from sticking to the tools. According to the North American Die Casting Association, melting the metal uses about 55% of energy in a die casting plant, and holding molten metal requires about 22% of energy. So, this information alone shows how big a part of the die casting process melting the metal is. As far as the actual process goes, there are a few different types of furnaces used to melt metal. These are crucible furnaces, gas reverberatory furnaces, gas stack melters, and coreless induction furnaces. Which furnace to use is determined by the volume and type of metal being melted. After the metal is melted in a furnace, it is then treated by degassing and skimming to ensure that there are no problems like gas porosity and inclusions, which cause defects in the castings. 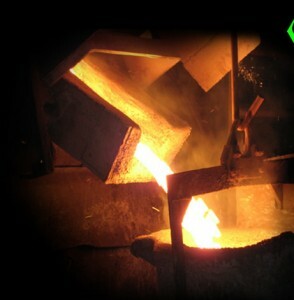 After degassing the metal is transferred to a holding furnace at each die casting machine. The purpose of the holding furnace is to maintain the metal at a constant temperature, because if a metal is not at its proper casting temperature, then it will not flow well and can cause problems such as cold shuts and other defects in the casting. Metal temperature is a major casting variable in the die cast process that needs to be tightly controlled to assure high quality die castings. For a bit of reference, here’s a chart showing the melting points of some common metals and alloys used in die casting. Next Next post: Happy Thanksgiving from Premier Die Casting!